The real space filler. Large, bushy plants which become smothered in bloom in the height of summer. 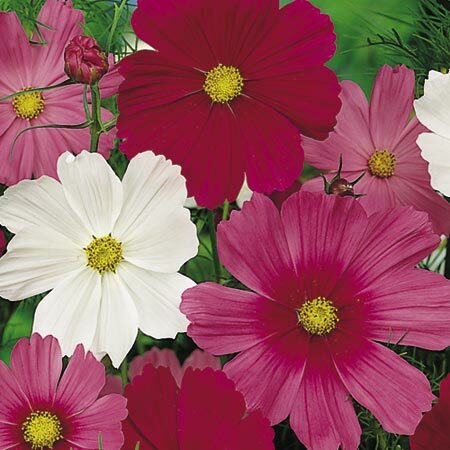 Large flowers, which like other cosmos are a great attraction to butterflies. Cosmos has few equals as a ‘space filler’ for larger borders at an economical price. Large flowers are well held above attractive finely cut foliage. What’s more they make great cut flowers too. RHS Perfect For Pollinators. Height 90cm (3'). HHA - Half hardy annual. Sow indoors and plant out for early flowering or sow direct outdoors in spring. Sow February-May to flower July-September. Suggested planting distance 40-45cm (16-18").